False Teacher – Francis Chan – A Call to Discipleship? 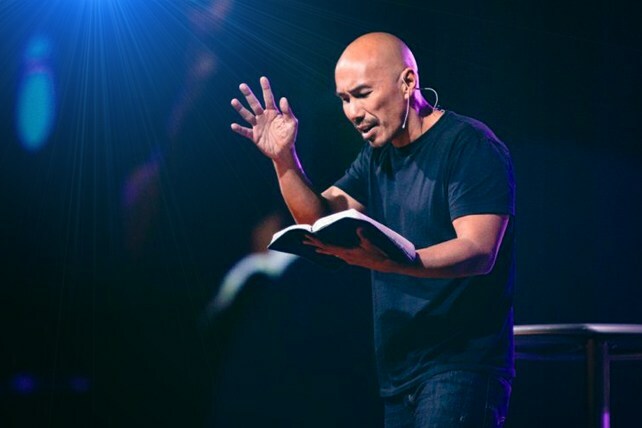 We were informed of Francis Chan by a believer in Christ whose daughter is acquainted with a young man who attended Chan’s Cornerstone Church in Simi Valley, California, and Eternity Bible College. Her daughter was considering going to California, where she would likely be involved, through the influence of her friend, with these organizations. Upon investigation and prayerful consideration, we advised against it. At Francis Chan’s previous website, one could read of Mr. Chan stepping down as pastor of Cornerstone Church because he feels a “call from God” to go elsewhere – he knows not where. Francis Chan is a nice guy – intelligent, clean-living, moral, friendly, likable, humorous, serious, sincere, engaging, and popular. But he hasn’t been a called minister of God all the years he has been at Cornerstone. And he hasn’t been connected with God to this day, as a true man of God would be. “And He said unto them, ‘…that which is highly esteemed among men is abomination in the sight of God’” (Luke 16:15 KJV). Francis has only been intellectually educated in men’s theological institutions (The Master’s College and The Master’s Seminary) and brought some of man’s doctrines and ways with him. Despite all the common trappings of men professing to be ministers of Christ, however, there is a curious difference in this situation with Mr. Chan, compared to other false teachers. We viewed a video of Francis discussing what he perceives to be a calling of God: Francis Chan Is Stepping Out in Faith…. We believe God may be drawing him, placing a search in him for a genuine walk of faith. While Francis seems to be relating to that call in terms of places and works, we believe God may be calling him to much more and better, calling Francis to Himself, to know Him for the first time. If there is this call, it is not to a specific work, but a general call to believe and become a disciple of Christ. In such a case, it is not strange that it is a mystery to Francis for now, because that is how God works. Countless thousands of preachers in the world have come in the Name of Jesus Christ to serve their own desires and imaginations. So has it been with Francis Chan, but it seems to me that Mr. Chan has had a seed of reality that has kept and led him to this point – I could be wrong. We still see in him a degree of lightness and lack of sobriety concerning the holy things of God; he seems to view Christianity as a “serious game,” but God can take care of that in His way, and one way or another, He will. As sincere as Francis may be (we give him the benefit of doubt), and as skilled as he has been in all his works as a human being, motivator, and communicator, he has been unlearned and without the call of God when it comes to serving the Lord Jesus Christ as a true minister. That is not to say that he has fallen short according to the light granted him. Still, if you read The True Marks of a Cult and Diabolical Doctrines, you will find more than enough to identify Francis Chan as just another worldly, presumptuous, run-of-the-mill “man of God,” who thinks to serve God according to the way he has been taught of men – much like the ambitious Saul of Tarsus, who learned under Gamaliel and had great zeal, but didn’t have the true knowledge of his God. We can’t condemn Chan for that, but he needs to know that he errs; he has not learned from God and taken on His ways, but from men, taking on their ways. And what is the nature of those appealing ways? “Concerning the works of men, by the word of Thy lips I have kept me from the paths of the destroyer” (Psalms 17:4 KJV). If people are looking for a social scene of pleasure and “clean” fun with a godly name tag to soothe the conscience, then they can follow any of a great multitude of various ministers, but if they want God, they better head in another direction altogether, which is straight to the cross. Could it be that Francis Chan is being drawn to the Lord and out of men’s works? We most certainly hope so. Many are the false and few the true. What Mr. Chan thinks to have been of the Spirit of God is nothing more than imagination from his religious indoctrination and upbringing. And people follow, not because of the Spirit of God, but because of Mr. Chan’s force of personality, doctrine, alliances, intellect, and eloquence – in short, carnal gifts. They are not being drawn to Christ. At his website, it says: “Because Francis and Lisa are still unsure what this ‘step of faith’ looks like for their lives, they obviously aren’t ready to meet with people with regard to serving together or to make a commitment to a certain ministry or country. They will be in prayer for wisdom and direction from the Holy Spirit and would appreciate your prayers for them as well. Moses is sitting in the wilderness, looking after his flocks, when he starts feeling a call, maybe from God? So then where is God? And how hard does He have to “try” to say something? Does He have a speech impediment? He Who made the mouth to speak, can’t He speak clearly? He Who made the ear to hear, can’t He cause one to hear? Must His message evolve over a span of time? God speaks to those He calls when He calls, He speaks unequivocally, and He is well able to make Himself clearly heard. He is not a man, and He does not do as man does, and He most certainly does not leave it up to us to determine His will. “But in going, it happened as [Saul] drew near to Damascus, even suddenly a light from the heaven shone around him. And he fell to the earth and heard a voice saying to him, Saul, Saul, why do you persecute Me? And he said, Who are you, lord? And the Lord said, I am Jesus Whom you persecute. It is hard for you to kick against the goads. And trembling and astonished, he said, Lord, what will You have me to do? And the Lord said to him, Arise and go into the city, and you shall be told what you must do” (Acts 9:3-6 MKJV). Here is the point – God does not leave it up to us to determine His will. As He has commanded us that “our yea be yea and our nay be nay,” so He does as He expects of us. He most certainly makes Himself clearly known. One, I was seeking to do my own thing, perhaps restless or dissatisfied with what I was doing or where I was. Two, He was drawing me to a deeper walk with Him, but not asking me to do anything. But when He did want me to go somewhere or do something, He told me straight out. For example, in the fall of 1977, my wife and I were talking, when suddenly He told us He was sending us to Israel – just like that. We hadn’t been talking about going anywhere that I can recall, but there it was. I wasn’t particularly set on going, and my wife certainly did not want to go – indeed, she was crying with reluctance – yet she had a witness from the Spirit that what I had heard was true. It took about two months to prepare, and we were on our way. God still didn’t say why we were going. We assumed it was to live in Israel, for the rest of our lives perhaps. We found out about six months after we got there that we assumed wrong. But He did with us what He had intended (to deliver His Word to Paul Cohen) and we were on our way back to…where? We were free to go anywhere, having no ties or obligations, but we knew it was to Canada. Where in Canada? We knew we would go to Winnipeg, Manitoba, and not to the city we lived in when we left. We didn’t hear His voice on these latter matters, we just knew where we were going. There was no pondering about it. Where in Winnipeg? Right from the airport, we were led to call former acquaintances, which were now in a Christian group, called “The Move,” founded by Sam Fife. We had little idea of what was going on there, but there we went, and we were received with open arms. And as we stayed with them, we were given to speak to them about their error. Admittedly, often God does not speak very loudly about some things. We have found ourselves just going and when we got there, we found that God had brought us. But we were not feeling a call. We could not say on those occasions, “We feel the call of God,” and we did not establish the whats or wheres by searching and prayer. When God did give the call to do something, it was simple enough for any child to hear and understand. General calls are different. I have been in the same state as Francis Chan more than once (three times in nearly 40 years) when it has come to a general call unto the Lord. “I’ve been sensing this calling for a while, that the Lord wants me to do something different…I don’t even know what it is. My wife and I have been talking about it, wrestling with it, really for the last couple of years…but a lot over the last couple of months, and…doing church in a different way, not necessarily the formal Sunday services, but I don’t know…I’m just tired of going back and forth…it’s not fair to the church, it’s not fair to anyone else…. This reminds me of something concerning our father in the faith, as recorded in Hebrews 11:8, except that Abraham was given a promise, whereas Francis does not say he has been given one; maybe he has. “It’s really crazy…I just don’t want to be making a mistake…sometimes in life you think you’re going towards God’s call, and you think, ‘Maybe I misred it,’ so…. Just kind of trying to keep in step with the Spirit…I’ve seen His hand in this…there’s peace in me, there’s peace in my wife, peace in my kids…which is crazy. How true are those words, and noble! I see that Francis is searching. I wish I could talk to him and Lisa and help them out of the works of men, but we will see if they are truly interested in the God of Israel, the Creator, by the cross, which is the only way to Him. Could it be that Francis is taking up his cross to follow the Lord? He is leaving much behind. Read the documents we suggest, and read at False Teachers Exposed. There, Lord willing and by His grace, you will learn what is true and what is false, what is of God and what is of men. May God open your eyes and bring your souls to peace and fulfillment in the Lord Jesus Christ. He will remove all those religious things in which men seek spiritual solace and comfort of the wrong kind. Let those who seek truth, righteousness, and peace take up the cross – that fearful thing which men hate, in which alone they will find true life. The cross of Jesus Christ is the only Way; there is no other; for only the death sentence will avail. Francis Chan has been weighed in the balance of God and found wanting. According to the measure of the Lord Jesus Christ, Chan has been, and remains, a carnal minister of the counterfeit church, a blind guide leading others into the ditch of fruitless religiosity. Whosoever has ears to hear, let him hear.